This lesson introduces Variables and Data Types in Sql Server. A variable is nothing but a name given to a storage location. We can place data into them and retrieve. Each variable in Sql Server has a specific type, which determines the size and layout of the variable’s memory; the range of values that can be stored within that memory; and the set of operations that can be applied to the variable. 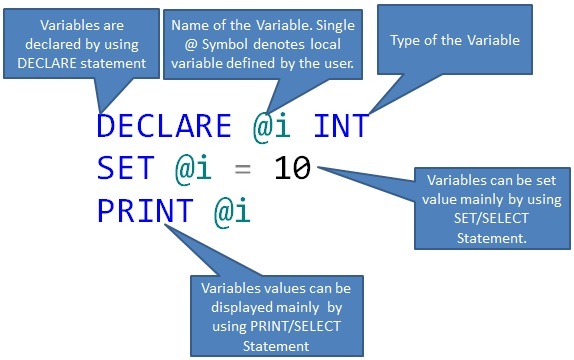 Variables can be declared by using DECLARE statement in Sql server as shown below. DEMO 3: Variables can be assigned value while declaring as shown below in Sql Server 2008 and above. DEMO 4: Variables can be assigned value by using SET/SELECT statement as shown below. SET statement can assign only one variable at a time. Let us go-through each of these categories of datatypes. BIT If there are 8 or less bit columns in a table, the columns are stored as 1 byte. If there are from 9 up to 16 bit columns, the columns are stored as 2 bytes, and so on. It can take a value of 1, 0, or NULL. DECIMAL[(p[,s])] or NUMERIC[(p[,s])] precision p, scale s. Example: decimal(5,2) is a number that has 3 (p-s) digits before the decimal and 2 digits after the decimal. Demo 1: For BIT data type we can take a value of 1, 0, or NULL. Conversion failed when converting the varchar value ‘TEST’ to data type bit. Arithmetic overflow error for data type tinyint, value = 260. Arithmetic overflow error for data type tinyint, value = -150. Arithmetic overflow error for data type smallint, value = 40000. Arithmetic overflow error converting numeric to data type numeric. Below were the only two Date and Time data types that were present in Sql Server prior to Sql Server 2008. Seconds value will always be 0. Seconds values that are 29.998 seconds or less are rounded down to the nearest minute, Values of 29.999 seconds or more are rounded up to the nearest minute. Storage: 3 to 5 Bytes based on the value of n (i.e. Fractional seconds precision). Storage: 6 to 8 Bytes based on the value of n (i.e. Fractional seconds precision). Storage: 8 to 10 Bytes based on the value of n (i.e. Fractional seconds precision). As n is optional if it is not specified, then it is considered as 7. Accuracy: 100 nanosecondsNote: DateTimeOffset defines a date that is combined with a time of a day that has time zone awareness and is based on a 24-hour clock. You may like to read Difference between DateTime and DateTime2 DataType. The conversion of a varchar data type to a smalldatetime data type resulted in an out-of-range value. Fixed Length Non-Unicode Character Data Type. For example if you declare a variable of type CHAR (10), then it will always take 10 Bytes irrespective of whether you are storing 1 character or 10 character in this variable or column. 1<=n<=8000. Can store Maximum of 8000 Characters. Variable Length Non-Unicode Character Data Type. It can store maximum 8000 Non-Unicode characters (i.e. maximum storage capacity is 8000 bytes of storage). It can store maximum of 2 147 483 647 Non-Unicode characters (i.e. maximum storage capacity is: 2GB). Fixed Length UNicode Character Data Type. For example if you declare a variable of type NChar(10), then it will always take 20 Bytes + 2 Bytes extra for defining offset irrespective of whether you are storing 1 character or 10 character in this variable or column. 1<=n<=4000. Can store Maximum of 4000 Characters. UNicode Variable Length Character Data Type. It can store maximum 4000 characters (i.e. maximum storage capacity is 8000 bytes of storage). The storage size is two times the actual length of the data entered + 2 bytes. Maximum storage capacity is: 2GB. Here Text and NText Character strings data type’s are not mentioned as they are not recommended instead their respective alternatives Varchar(MAX) and NVarchar(MAX) which were introduced in Sql Server 2005 can be used. Below articles gives detailed insights into the Character String Data Types. 1<=n<=8000. Can store Maximum of 8000 bytes of data. The storage size is n bytes. Variable Length Binary Data Type. It can store Maximium 2GB of data. Here Image data type is skipped as it is not recommended instead it’s alternative VarBinary(MAX) which was introduced in Sql Server 2005 can be used. A data type that stores values of various SQL Server-supported data types, except the values of the datatypes varchar(max), varbinary(max), nvarchar(max), xml, text, ntext, image, timestamp, sql_variant, geography, hierarchyid, geometry, User-defined types, datetimeoffset. For example, a column defined as sql_variant can store int, binary, and char values. It can be initialized by using NEWID() function or by converting from a string constant in the form xxxxxxxx-xxxx-xxxx-xxxx-xxxxxxxxxxxx, in which each x is a hexadecimal digit in the range 0-9 or a-f. For example, 6F9619FF-8B86-D011-B42D-00C04FC964FF is a valid UniqueIdentifier value. you are prompt to fix the error. Thanks. Thanks Srini. Appreciate your comments. Thanks Sricharan. I am happy that this article helped you.